The photo taken by Joseba Etxaburu is no. 85 from a total of 91 photos which go to make up a summary of the whole year in photos from this agency. 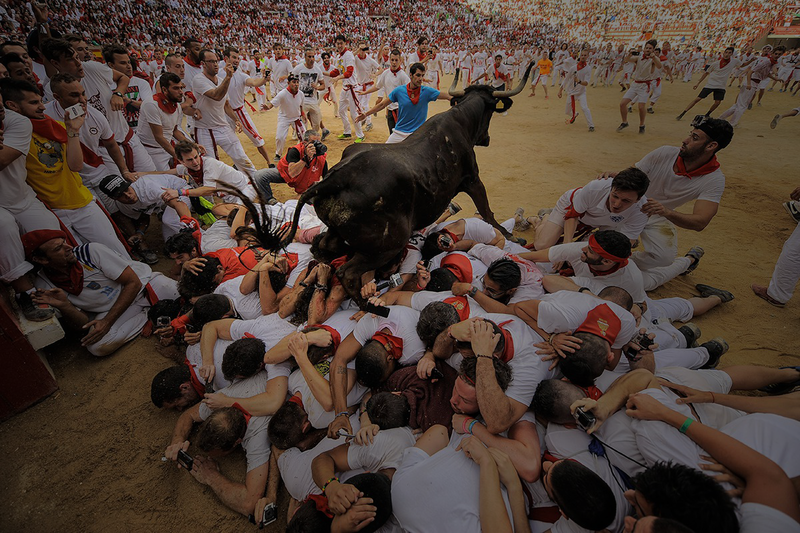 In order to get take the photo, taken with a low-angle shot by Joseba Etxaburu, the photographer had to jump into the arena and get down on his knees in a dangerous stance. He needed to keep his concentration and to be very fast to catch an image that lasts less than a second. In fact, there is a counter-image to this photo which was taken by another very good photographer, Carlos Mediavilla Arandigoyen, from just the opposite side at that same moment. This impressive photo shows the exact position of Etxaburu as he is about to get his photo, alongside another photographer, Alvaro Barrientos from AP who is just a little to his right. © AFP Álvaro Barrientos. 8 de julio de 2015. Sanfermin. Pamplona. 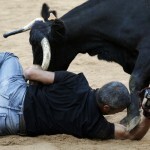 And perhaps a sense of justice has been returned to Joseba Etxaburu with this photo. 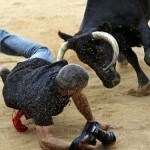 Because in 2012, the photographer suffered a tossing by a young heifer when he had tried to get a similar snapshot from inside the bullring arena. 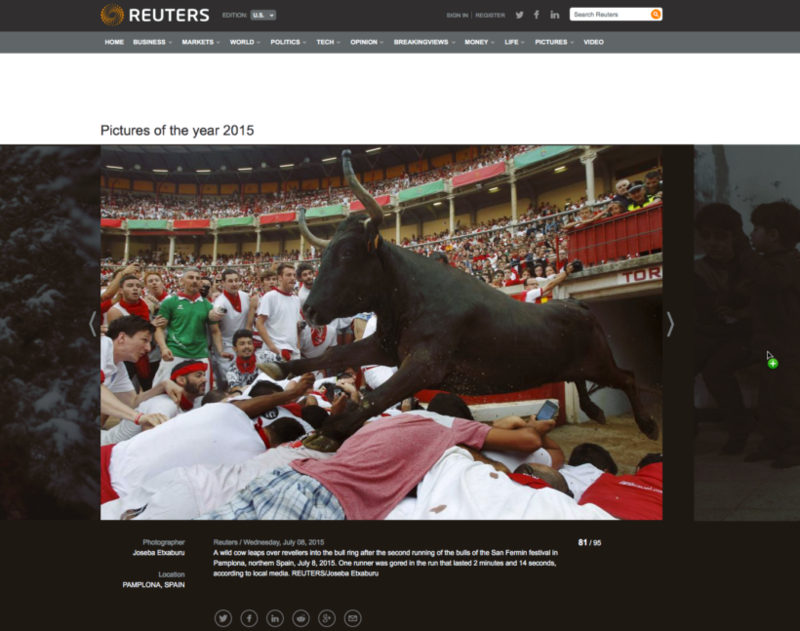 On that occasion, his colleague and fellow-photographer, Susana Vera took a snapshot of the tossing and it was selected by the same agency as one of the best Reuters 2012 images with Joseba Etxaburu as the unfortunate protagonist. The young heifer did not cause any injury to Etxaburu at the time but the image was seen around the world. 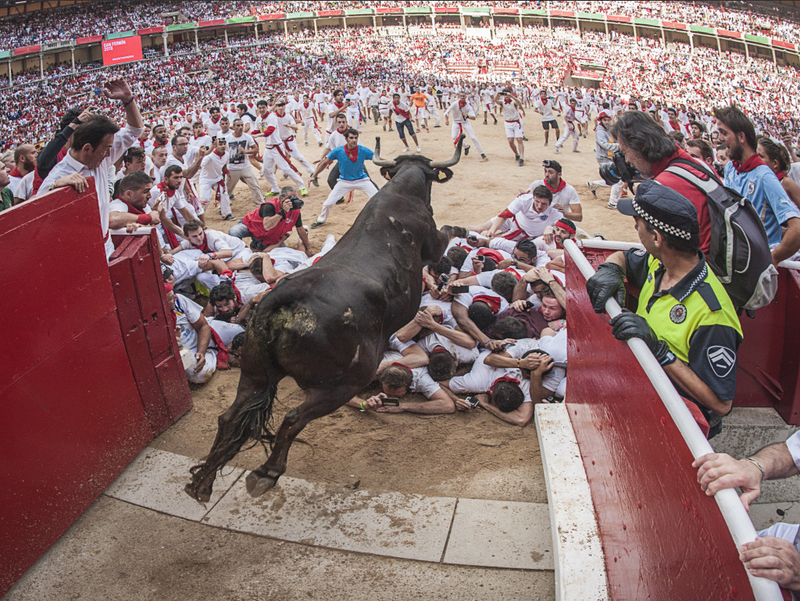 Both events tell us a lot about the drive and commitment of a photographer like Etxaburu, as year after year he tries to get some great San Fermín images for his agency. 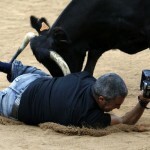 © REUTERS / Susana VeraReuters photographer Joseba Etxaburu is knocked down by a wild cow during festivities in the bullring following the sixth running of the bulls of the San Fermin festival in Pamplona July 12, 2012. Etxaburu suffered some scratches on his right elbow but was able to continue shooting afterwards.